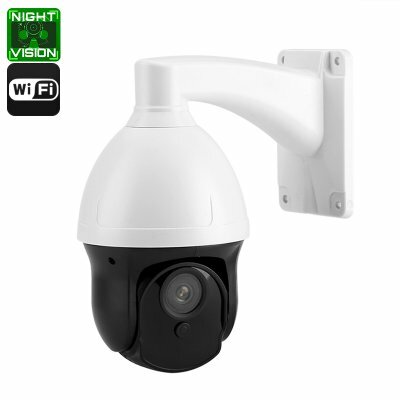 Successfully Added Pan Tilt Dome Camera - 1/3 Inch 1MP CMOS, Motion Detection, 320 Degree Pan, 90 Degree Tilt, Wi-Fi, Night Vision, IR Cut to your Shopping Cart. This pan and tilt camera comes with an enclosed weather resistant dome making it suitable for indoor or outdoor surveillance. The pan and tilt functions allow it to cover a large area as it rotates through 320 degrees and tilt 90 degrees. All of which can be controlled through the supplied software. With a 1/3 inch 1.3MP CMOS sensor the camera brings HD video surveillance that can be viewed online remotely by up to 4 users at once. The support for mobile phones means you can also watch the feed on an Android or Apple smartphone or tablet. Real time monitoring with 9 preset PTZ zones and motion detection alarms will alert you to any intruders. Equipped with IR SMD arrays this IP camera has night vision that is capable of seeing clearly in low light down to 0.02 lux, around the same as moonlit night. With up to 25 meters night vision and with IR-cut the camera will automatically switch between day and night mode so you'll have 24-hour security surveillance to protect your property. With an included wall bracket the camera can be attached to any flat wall where it will be able to offer surveillance of a wide area making it ideal for storage rooms, warehouses and large open spaces. This dome camera supports wired and wireless connectivity so you will have greater freedom to mount the camera wherever you wish. Coming with CMS software and motion detection recording the camera is quick and easy to install. With a free app for iOS and Android devices, you can log into this camera and see the live feed from anywhere in the world. This pan and tilt dome camera comes with 12 months warranty, brought to you by the leader in electronic devices as well as wholesale IP cameras and surveillance systems..